Tickets for the Sagrada Familia in Barcelona are cheapest and best bought online as timeslot admissions, or as part of fast track entry guided tours. Gaudi’s Sagrada Familia church is one of the top sights to see in Barcelona and one of the most-popular attractions in Spain. Admission to the Sagrada Famlia is only on specific timeslot tickets and these are cheapest and best bought online in advance. Tickets for the Sagrada Familia sell out most days making queuing at the church often futile. Buy tickets online at least two days in advance and much earlier during busy periods. 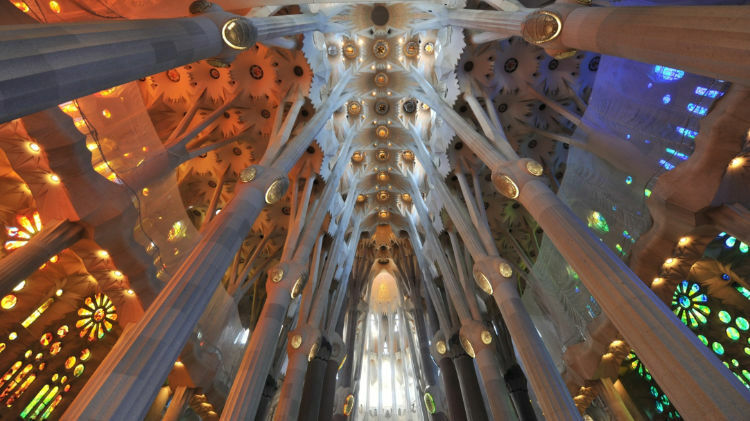 Guided tours and combination tickets with further Barcelona sights are good savings options and may give easier admission to the Sagrada Familia at very busy times. Buying advance reservation skip-the-line time-slot admission tickets online for the Sagrada Familia church in Barcelona is almost essential and the cheapest way to gain admission to the famous Gaudi-designed church. All admissions to the Sagrada Familia are only per specific timeslots, whether as individual traveler or part of a tour group. During the high season, and even much of the lower season, tickets for Sagrada Familia sell out every day and no amount of queuing will ensure admission without timeslot tickets. Ticket options for the Sagrada Familia include time-slot admissions only, time-slot admission with audio guide, time-slot admission with official guided tour, time-slot admission with audio guide and tower access, fast-track admission for guided tours and fast-track admission for guided tours that include further activities. The cheapest tickets for the Sagrada Familia are directly from the official website but skip-the-line tickets are also available from many resellers including Tiqets and GetYourGuide. The most basic ticket is just for timeslot admission but it is possible to add an audio-guide, an official guided tour or tower access. Seeing the towers (elevator up, stairs down) is optional but must be booked at the time of buying the ticket – it cannot be added later. The fairly steep surcharge for tower access always includes and audio guide for the church but never a guide. The Sagrada Familia opens daily at 9 am, which is also the best time to visit. It closes at 18:00 from November to February, 19:00 in March and October, and 20:00 from April to September. Last admissions are 30 minutes before closing but a rushed visit takes at least an hour but it is easy to spend much longer here – two to three hours are common. Add at least half an hour when visiting a tower. Tripadvisor users generally praise the audio guide for being informative without being overly detailed or boring. However, many other audio guides (several free) are available online. Youths (11 to 29 years), students and visitors over 65s receive a small discount. Admission is free for children up to 10 years old but they do need a free time-slot ticket as well. The minimum age for tower access is 6 years. Audio guides are not available for children under 10. The official dress code is for modest dress. Strictly speaking that means no bare shoulders while shorts and dresses should cover at least the knee but this is generally not too strictly enforced. However, if the personnel says no it remains no. The best times to visit the Sagrada Familia is first thing in the morning, i.e. 9:00 not 10:00. A very good alternative is after 15:00 but before sunset, as darkness certainly spoils the light while the rays of the setting sun could be magical and great for photos. An advantage of a late afternoon visit is that the church will get progressively quieter rather than busier, as is the case in the morning. Visitors ascending the towers may particularly find afternoon visits more pleasant, as a descent from the tower first thing in the morning will certainly bring the visitors into a much busier church than it was before going up in the elevator. Note: It essential to stick to the exact 15-minute timeslot. Admission is almost never given to anyone turning up outside the specified time slot. Similarly, group tickets may only be used if entering together as a group not as a late-arriving individual. The cheapest guided tours of the Sagrada Familia church in Barcelona are the official church guides. These 45-minute tours sell out fast, as they are offered only a few times per day. An astonishing number of guided tour options for the Sagrada Familia is available to see the church as part of a private group tour. These groups typically assemble at the tour operators office near the church and then proceed as a group through the fast-access group entrance – miss the group and no admission is possible without being in the specific group. These tours typically last from just over an hour to two hours with the longer tours often hardly more expensive than the express tours. At the end of the tour, it is of course possible to remain behind in the church to explore further. As for solo admissions, early morning or late afternoon is better than mid-day. Guided tours are by qualified guides and all use earpieces, as it would otherwise be impossible to hear the guide in the crowded church. Guides are surprisingly easy to loose in the busy church – best to take photos after the tour has ended. Private guided tours of the Sagrada Familia church often include one of the towers – either the Nativity tower (55 m / 180 ft) or higher Passion tower (75 m / 250 ft). (The price is the same so if given a choice many opt for more is better.) These guided tours end at the elevators, as guides are not allowed to ascend. Visitors take the elevator to the top of the tower and then walk down via the spiral staircases. The views of Barcelona from the towers are not particularly inspiring. The main attraction of ascending is to get close to the architecture and to enjoy the views of the church building on the way down. The towers certainly are less overwhelmingly impressive than the marvelous interior of the church itself. A wide variety of combination tours are possible that adds further Barcelona sights to a visit to the Sagrada Familia. These may often add more value and savings compared to just a guided visit of the church. It is important to note carefully what is included and what not in these guided tours. Tour operators are keen to tell just how much is included, so unless a skip-the-line admission ticket is specifically mentioned, assume it is not. Some tours only include time-slot reservations meaning visitors still have to buy further admission tickets. A photo of the church also does not mean it is seen from the inside: it is quite possible “to marvel at the Sagrada Familia” without entering but anyone may do so from the outside at any time for free. If planning to stay for longer in the church make sure the tour ends at the Sagrada Familia, or if preferred at a sight such as the Park Güell where it may be fun to stay longer than the tour. The Sagrada Familia is commonly the highlight of longer tours of Barcelona. Full-day tours are often hardly more expensive than half-day tours and small groups are more pleasant than larger groups. Some have hotel pickup service. Private tours are also possible and may work out cheaper for small groups. E-bike tours are increasingly popular and an easy way to get about the city and to see more than is possible on walking tours. However, on many e-bike tours it is not possible to stay in the church at the end of the tour, as the bicycle must be returned to the rental shop. Many tours combine the Sagrada Familia with other modernist and Gaudi buildings in for example walking tours, or including visiting the Casa Batllo, Sant Pau Art Nouveau and other Gaudi sights on a full-day tour. When comparing prices consider whether further admissions are included, transportation options and the duration of the tours – longer tours may cost more but often add more value if more sights are included. A particular saving combination is the Sagrada Familia and Park Güell with skip-the-line admission tickets to both. When comparing prices consider whether transportation between the sights are included and how much time is spent at each site. The order of the visits may also be of interest to stay longer at the end of the tour. The Park Güell can be very hot on a sunny day and is best seen first thing in the morning both to avoid crowds and the midday sun. Some tours allow for visiting the Sagrada Familia and Park Güell on different days. Combining the Sagrada Familia with the Montserrat Monastery or Montserrat Monastery and wine tasting is also popular for a full day tour. However, these tours are often done as two separate tours with a visit to the monastery (or church) in the morning and regrouping later in the afternoon as a separate tour for the church (or monastery). It is also possible to combine the Sagrada Familia with more spectacular options such as sailing off the Barcelona coast and seeing the church from the water, or taking a helicopter flight to see the Sagrada Familia (and Barcelona) from a bird’s eye view. Whatever the budget, the most important thing to see the Sagrada Familia in Barcelona is to reserve timeslot tickets online and in advance.